I am in awe of the natural beauty around me. Capturing the unique elements within a single image is what inspires my daily life as a photographer. My subject for this picture is a Night Blooming Cereus, which I believe is one of the most interesting desert plants in Phoenix, Arizona. What is so intriguing about this plant is, like its name, the flower only blooms in the darkness of night, and after it blooms, it only survives a day before it begins to wither and die. A life so precious, yet so fleeting is worth capturing on a camera. So, when I just happened to be home from NAU on March 25, my mom told me to grab my camera because the neighbor’s Night Blooming Cereus was in full bloom. I am happy I was home that weekend for the opportunity to take a picture of such a spectacular flower that tells such a unique story about life and death. The Night Blooming Cereus’ elegance accurately illustrates how life is so full and animated, and yet so short and sweet all at the same time. In any nature shot that I take, I always aim for simple, pure, and colorful image. I believe this to be my style. For this photo in particular, I chose a shallow depth of field (f/2) because of where the flower blossomed and the angle I needed to take the picture. I attempted to minimize distractions from the rocks and background the best I could given the photographic circumstances. To get this angle, I laid on the ground as my 8-year-old brother assisted me (and complained the whole time as 8-year-olds do) in holding an off-camera flash to my left to fill in a minimal amount of the shadows the plant casted on the petals of the flower and the rocks below. I like the look and sense of depth that the remaining shadows add to the image so I chose to leave those in the shot. I captured this image with an ISO of 100, 1/4000 sec and f/2 close to noon on a cloudless day in sunny Gilbert, Arizona. Captured on a Nikon D3100 with a Nikon 35 mm f/1.8 lens. Simple post processing edits consist of small adjustments to the brightness, contrast, and hue/saturation of the image. I applied a blue filter to the image to cool down the overall tone slightly. The original orange and red colors in the rocks took away attention from the flower before I made this adjustment in Photoshop. Overall, this image closely resembles the original shot in its natural form before post processing occurred. My name is Jessie Tofaute, and I’m a photography major at NAU. I have been perusing my love for photography since my freshmen year of high school when I took my first introduction to photography class. It has been my favorite pastime ever since and is something I see myself doing all my life as a career and a hobby. I enjoy capturing memories for myself and others while learning all I can about the art. I love documenting my travels through photographs. I equally enjoy taking portraits of special occasions for clients as seen on my business website: jessietofaute.wix.com/photography. To read more about the Northern Arizona University “Behind the Image: Guest Blogger” project on our blog, please read the introduction at youcansleepwhenyouredead.com/wordpress/4th-annual-northern-arizona-university-behind-the-image-guest-blogger-project. Please take a minute to leave your thoughts and constructive comments in the Comment section below – Jessie would love to hear from you! The image portrayed is mainly told through its candid imagery. A girl sits by her window looking outside with a towel wrapped around her head after she sips her warm coffee. I didn’t want to stage her emotion, I wanted it to feel natural as if the image was a mere freeze frame of her motion through her hands and face. It had been a cold day outside, thus the desaturated overall illustration of inside the apartment complimented the weather outside. Also the heightened highlights juxtapose the sunlight that’s trying to pierce through the clouds on the outside. With all of this in mind, I wanted the scenery to be a calm one by not overcomplicating what was in the frame and just be a simple shot of the girl and the window as the main subjects. I love human interaction and their emotions to their surroundings. This image represents a piece of life, and with the natural lighting it develops a raw scene that surrounds the girl, the window, and her thoughts. Simple human interactions are easily relatable. And with this image, what isn’t so relatable about having a sip of coffee while in a deep state of mind? When I’m trying to come up with a story for one of my film projects, I limit distractions and only spend time with my imagination. Having that deep state of mind, she could be thinking about anything, about a positive or negative thought. She’s neither smiling nor directly frowning, which opens the wide range of emotions. She opens her mind by looking out the window to expose her mindset in broad way because of how the open world incites different feelings and thoughts. I shot this image on a Canon 70D, 1/200 shutter speed, 3.5 aperture, 18 mm lens, and an ISO of 800. I’m also big on filmmaking and I typically use the same lens and camera, and the only difference from past images and this one was that I usually increase the saturation for photos and with film I color grade by desaturating the image. In effect, I desaturated this image as if to resemble a freeze frame of a film locked in a drama genre. I would also include a letterbox (the black bars on the top and bottom of the frame) but that would be too close in mended as a part of a film. This image should stand on its own with the possibility of being part of a film but still framed up as a standalone. Raised in the suburbs of San Bernardino, California, I completed many AP and Honors courses and graduated at the top ten-percent of my class. As a result of this, I’ve been too deep into my classwork to prove my worth. I always enjoyed drawing and storytelling through comics that got me into becoming passionate with filmmaking half way into my middle school career. During my second year of college, I took my first photography class. With filmmaking, there’s an expanded way of storytelling, whereas photography you must capture an entire world and its backstory within one image. The fact that I love storytelling allowed me explore the subjects that I want to tell stories from. I’ve grown to know that human experiences/interactions is what intrigues me the most. That’s what inspires me: to tell others’ stories, including my own. What separates me from others is that I enjoy both bright and dark themes. I’ve come to know that both contrasting emotions sparks one another and they can’t simply live or portray without the other being present. To read more about the Northern Arizona University “Behind the Image: Guest Blogger” project on our blog, please read the introduction at youcansleepwhenyouredead.com/wordpress/4th-annual-northern-arizona-university-behind-the-image-guest-blogger-project. Please take a minute to leave your thoughts and constructive comments in the Comment section below – Miguel would love to hear from you! 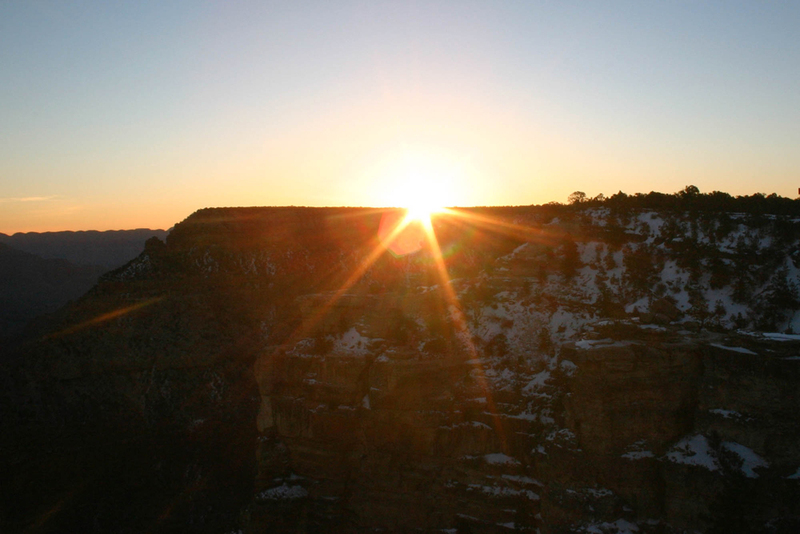 This photo is of a sunrise at the Grand Canyon. I’m not a person who would normally wake up at 3 AM on a freezing February morning to go to the Grand Canyon, so I wanted to capture this moment in this photo. I was waiting around for about an hour in the cold and dark, so when those rays peaked over the snow covered canyon, illuminating the sky, I was more than ready. Getting to the Grand Canyon started off quite comical. My roommate’s car door was frozen shut, so when I yanked it open it wouldn’t close again. I held the door shut as we drove to our very early breakfast at IHOP. Thankfully, after eating, the door decided to cooperate and I wasn’t left holding it closed all the way to the Grand Canyon. When we got there it was pitch black and we still had time before sunrise. We waited in the car until suddenly we noticed the sky beginning to lighten. We were panicking that we’d miss what we came for, so we wrapped ourselves in blankets and ran all the way to the outlook. The horizon was still dark. We waited, and waited, and waited. More people started to gather around, as it got closer to the sunrise. We all waited in anticipation. The sky slowly lightened more and more. I started taking pictures but they were still too dark to see much detail. I’d have to wait even longer for the perfect shot. I stood directly in front of where the sunrays were going to peak over. I finally got to shoot when the sun was high enough. Many of the pictures had sun flares though. So I chose this image as my favorite because of the centered subject, detail in the snow covered canyon, and minimal lens flares. This photo captured a moment that I probably won’t wake up at 3 am again to create. I shot this photo with my Canon EOS Digital Rebel and a 18mm-55mm lens at 22mm. My ISO was at 400 and my shutter speed was 1/60. My aperture was set at f/22 to allow me to capture the sunburst. As far as post processing goes, I resized, lightened up some shadows, and healed some dust spots in Lightroom. 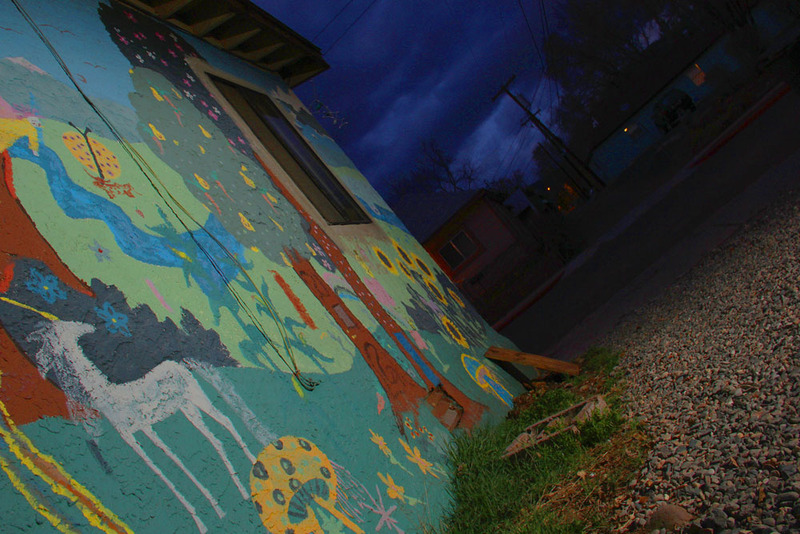 My name is Erika Berry and I’m a junior and photo minor at Northern Arizona University. I’ve always liked photography and taking pictures as a hobby even though I may not be the best at it. I prefer taking photos at leisure rather than having a specific assignment. My favorite subjects to photograph are candid pictures of people. I like working in natural light a million times better than indoor light. I’m hoping that the tips and techniques I’ve learned through photo classes at NAU will help enhance my photography. To read more about the Northern Arizona University “Behind the Image: Guest Blogger” project on our blog, please read the introduction at youcansleepwhenyouredead.com/wordpress/4th-annual-northern-arizona-university-behind-the-image-guest-blogger-project. Please take a minute to leave your thoughts and constructive comments in the Comment section below – Erika would love to hear from you! 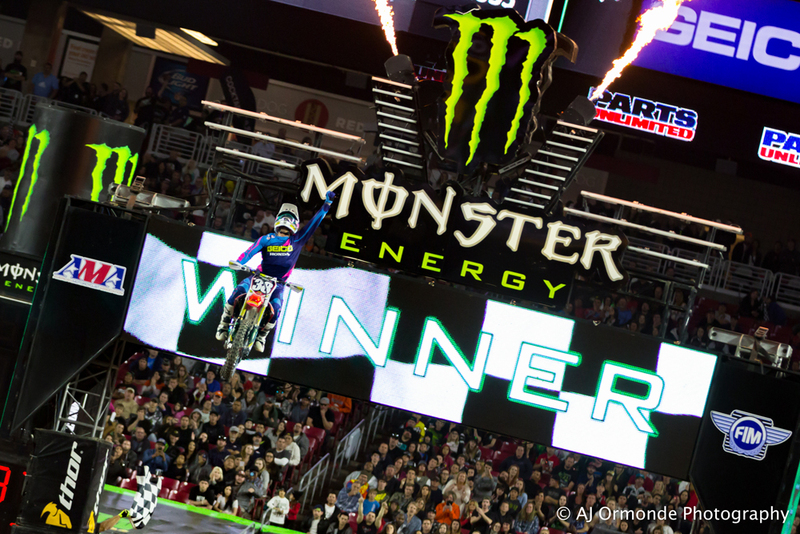 When it comes to Supercross and fast paced, action packed racing such as this, there are restrictions as to how close you can go to the track when shooting on track. Inspirations and plans are made to capture certain photos during training in the week before a race. Since I do not have these credentials yet, I shot this photo from the stands with the goal of capturing the “big moment” in one rider’s racing career. My inspiration and thought process was to capture 3 main elements in one precisely timed photo: the finish (checkered flag), the pyrotechnics (flames on top of the finish line) and lastly the celebration (fist pump in the air). In photography, having connections and maintaining these relationships is vital for a new photographer such as myself. With that said, I did not use my own lens for this particular day, rather, I was using a friends lens that was far out of my reach when it comes to price point. I was using the new Canon 70-200mm f/2.8 with my Canon Rebel T3i. Might I add, this was the fastest lens I have ever used in my 14 years of photography, so I was very ecstatic that my friend gave me the opportunity to use this lens. When it comes to metadata of the image, and details of the camera used, I shot this at 1600 ISO, zoomed in at 140mm (in order to get all 3 main elements I wanted), aperture of f/2.8 and my shutter speed at 1/800 sec. I did not use filters since I purposely shot the photo in RAW which allowed me color fixes in post processing with Adobe Lightroom. When it comes to post processing, I choose Adobe Lightroom over Photoshop when I don’t need to stack photos or edit people or objects out of the photo. Temperature and tint are always the first thing I adjust. Next I adjust highlights and saturation and I simply go down the list on the side of Lightroom of what I think can better the image. My name is Andrew Ormonde and my passion and career is photography. Ever since I was 6 years old, I started to take photos of everything, then later in life realizing my passion for action sports photography. Though action sports are my forté, I also take portraits, nature and long exposure, as well as anything that may peak my interest, though I prefer Supercross and Motocross because of my experience with racing and off-roading. I edit with Lightroom when I don’t need to stack photos or edit people or objects out of the photo. I currently attend Northern Arizona University in Flagstaff, AZ. My major is photography, and with it, I plan on making photography my life time career. To read more about the Northern Arizona University “Behind the Image: Guest Blogger” project on our blog, please read the introduction at youcansleepwhenyouredead.com/wordpress/4th-annual-northern-arizona-university-behind-the-image-guest-blogger-project. Please take a minute to leave your thoughts and constructive comments in the Comment section below – Andrew would love to hear from you! 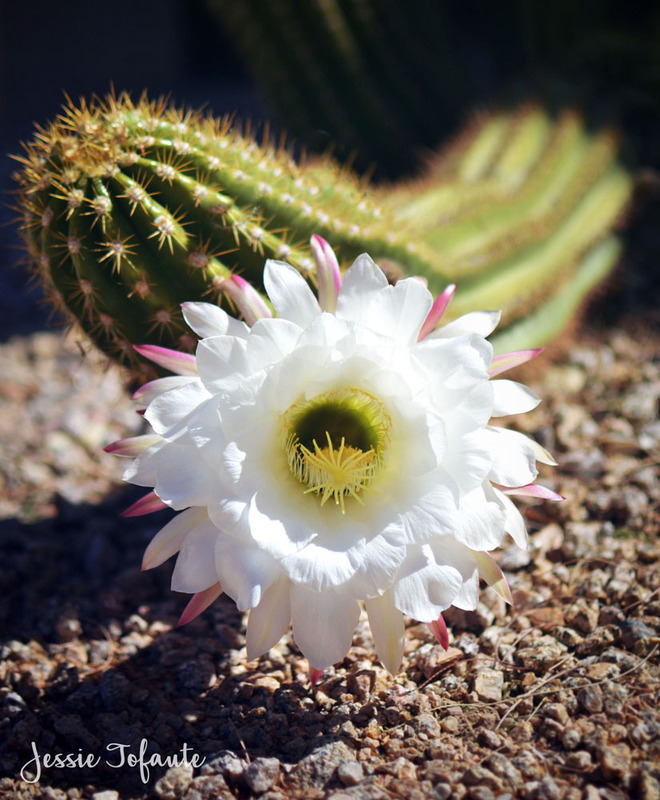 While I was home one weekend from NAU, my parents suggested going to the Desert Botanical Gardens down in Phoenix. 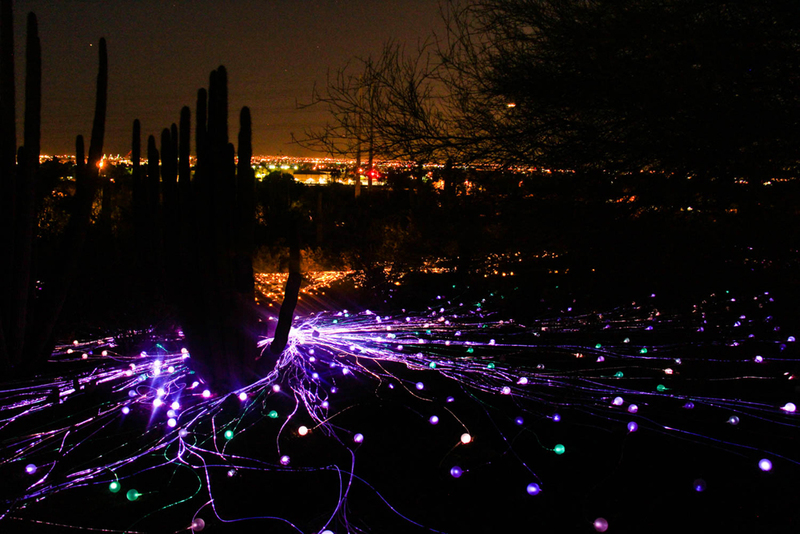 At nighttime, the gardens host a special event called “Sonoran Light” by Bruce Munro. Munro’s art reflects across the desert with a mixture of acrylic, light, and other items that bring the desert to life at night. The careful placement and themes of each piece reflect well with the night feel of the desert. When I found out that I was going to this event, I wanted to take a picture that was unlike all the ones I’ve originally seen. As I was walking around, I basically took pictures of everything I saw from every angle. However, when I approached a mountain draped in beautiful color changing lights, I knew it had potential. I began taking pictures of the mountain; it was completely covered in lights as seen in my photo. These lights changed colors every few seconds. However, what I captured didn’t interest me as much as the lights on the ground and the background of the city of Phoenix. The bright city lights and the night sky were much more captivating than just the mountain itself. When I saw this scene I immediately knew this was my chance to get a unique picture. However, I didn’t bring a tripod with me to fully capture the brilliance of the lights and the night sky at the proper exposure. I noticed a drinking fountain and decided that that was my best bet. 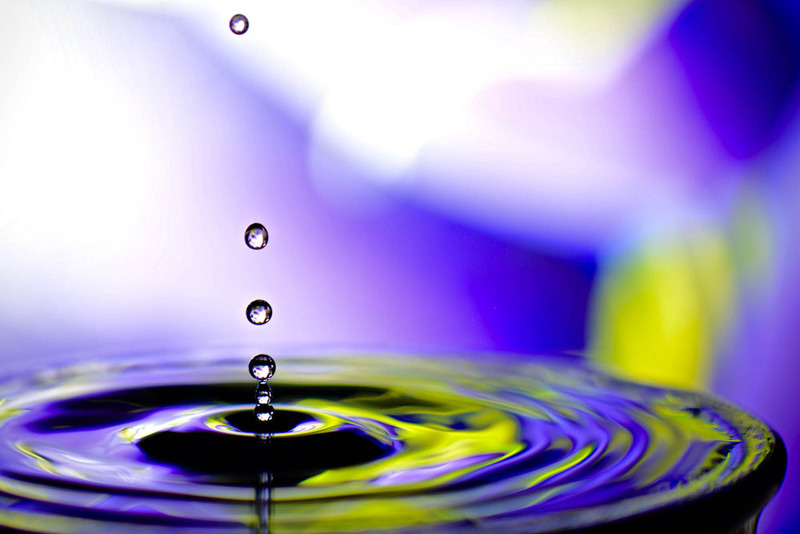 I set my camera on top of the flat part leading to the fountain and simply clicked the shutter. One shot was all it took. Without the stable use of the water fountain the picture would’ve been underexposed and completely blurry. I captured this image at an ISO of 800, an aperture of 3.5, and a shutter speed of 1 second using a Canon T5 with an 18-200mm lens. I edited this image to make the colors pop more and look more vibrant. All in all, I want to communicate to other photographers that even when you think a shot is impossible to capture, think outside the box and try something new, you never know what you may end up with. I also really encourage going to the Sonoran Lights at Desert Botanical Garden because the lights are really stunning to look at it and for picture taking as well. My name is Kaylee Johnson and I’m majoring in photography at NAU. I have been taking pictures for seven years now and I absolutely love photography. In high school, I was in yearbook and photographed sports for three years, and then became the editor and chief and took pictures around the school. Here at NAU I work for NAU Athletics and take pictures at sports games and other events going on around campus. My photography ranges from everything to portraits, landscape, sports, and anything else you can think of. I can’t wait to see what my future in photography holds. To read more about the Northern Arizona University “Behind the Image: Guest Blogger” project on our blog, please read the introduction at youcansleepwhenyouredead.com/wordpress/4th-annual-northern-arizona-university-behind-the-image-guest-blogger-project. Please take a minute to leave your thoughts and constructive comments in the Comment section below – Kaylee would love to hear from you! In our class earlier this semester, we were given a portrait assignment with off-camera flash and I knew immediately that this photo would be a challenge for me. Most of the portraits I take are of my nephew, who is just over a year old. I love the kid, but he doesn’t listen very well to instructions for photos! I’m not used to having so much control over my subject, and it can be hard for me to come up with poses or ideas for the portraits. I went to my roommate, Marti, in my Tuesday afternoon crisis (our photos for class are due on Wednesdays), and persuaded her to be my model. We set up in our apartment living room and the shoot started out with me blinding her a few times since I’m still new to the world of external flashes. Once I managed to get the flash figured out, it was just the question of what to have her do. I like portraits that show happy, smiling people best. I started with telling Marti to smile. We tried more candid-looking shots of her laughing, as well as some other basic happy shots. We tried using props including a coffee mug, a Fifty Shades of Grey novel, and a chef’s knife. I looked at her at some point during the shoot and decided that since she has such beautiful eyes, I wanted to focus on them. I came up with the idea of the scarf hiding some of her face, leaving an air of mystery in the shot. 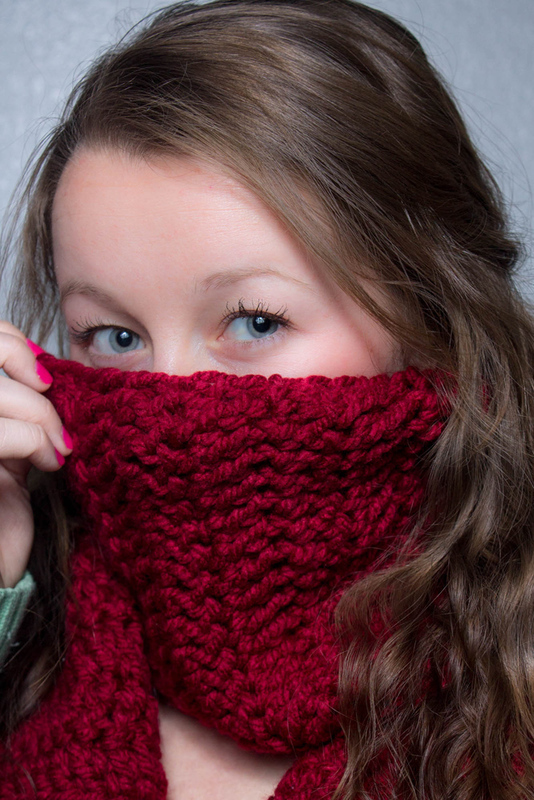 I feel the vibrant red of the scarf was a great contrast to her lighter eyes. I was a bit worried about the scarf being a distraction from her eyes, but I think viewers are still immediately drawn to them. I shoot with a Canon Rebel T3, and I use the kit lens, an 18-55 mm. My focal length was at 42 mm for this photo. My aperture was at 6.3 and my shutter speed was 1/160 of a second. I currently use is a Yongnuo YN560-IV flash. I don’t have very much experience with Lightroom, so I don’t do much post-processing on my photos. I believe I softened her skin just slightly for this one. I was very happy with my result in the end. Not too bad for a girl who doesn’t take many portraits! Going back to the quote by Diane Arbus, I think knowing the story behind the image can change a person’s feelings about the photo. I find that sometimes I want to know the story, but sometimes it’s fun to be left to my imagination and fill in the blanks myself. You might not be able to guess the true story behind my photo here: a tale of challenges, trial and error, and even a bit of humor (at least I find it funny). Some might feel that this story detracts from the photo, making it less interesting. I think it adds to it. This photo is from a time of growth as a photographer for me. I feel more confident in taking portraits now. I come from a very small town in Southern Arizona by the name of Ajo. My passion for photography began when I was a little girl, playing with the family camera. I photographed anything and everything. I finally got a DSLR in high school, and I often took photos for my yearbook class and local newspaper. My favorite subjects to photograph are my nephew and vehicles, but I love being able to capture a moment and I’ll shoot just about anything I find interesting. Photography will most likely end up a lifelong hobby for me. I have no goals to become a professional, but I enjoy improving my skills and learning more about both my camera and myself. To read more about the Northern Arizona University “Behind the Image: Guest Blogger” project on our blog, please read the introduction at youcansleepwhenyouredead.com/wordpress/4th-annual-northern-arizona-university-behind-the-image-guest-blogger-project. Please take a minute to leave your thoughts and constructive comments in the Comment section below – Cassandra would love to hear from you! I took this photo while on a camping trip with my boyfriend and my dog at Windy Hill campground. A drive that was supposed to be less than 3 hours became over 5 after a series of misadventures. First the mobile map led us to an empty parking lot, and then when we made it to the campground it turned out to be temporarily closed, we finally found a place to stay at around 1 in the morning after driving an extra hour to Globe in order to get a Tonto parking pass. We had set out to spend a fun weekend swimming in the Salt River, but ended up on the edge of a lake that can’t even be swum in at a campground filled with snowbird retirees in their RVs while we slept in my yellow tent. Even though it was not what we had planned, the unexpected camping destination became just what it took to find the inspiration I needed and provide the adventure I craved. I was born and raised in Prescott, AZ and have always considered the greener and lusher parts of the country to be far more beautiful. Growing up spending summers by a lake in Maine made me dislike the dry climate even more for most of my life. This changed when I started camping in central Arizona, which has taught me to truly appreciate the unique beauty of the desert. There is no greater feeling than sitting by a campfire as the sun sets over the desert and the coyotes start to howl at the moon. As beautiful as moments like this are, they never last for long until the impulse to capture the scene overcomes the desire to simply enjoy it. Depicting the relaxed bliss of camping in the Valley was exactly what I hoped to accomplish with this image. Arizona has beautiful sunsets and spectacular cacti; I wanted to encapsulate both of these in a photo. 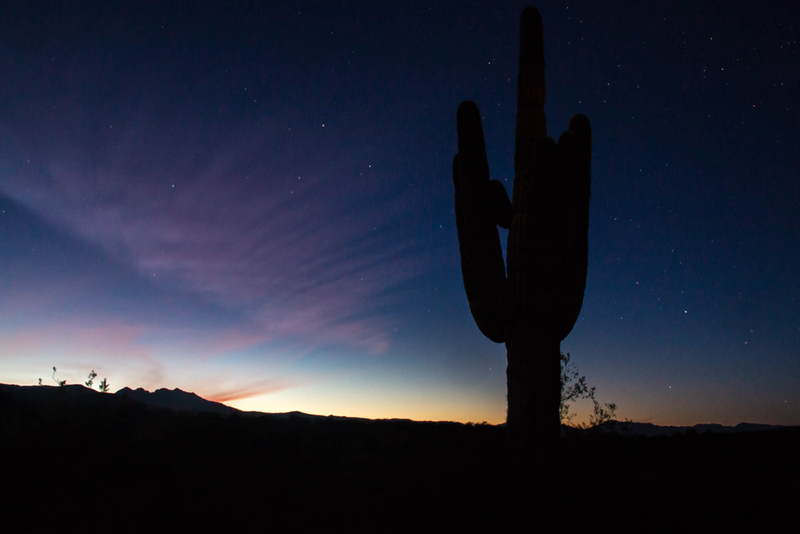 This image was taken using my Canon 70D with an 18-200mm lens sitting on a tripod while I was crouching on the ground so that I could photograph the silhouette of the saguaro in front of the remnants of the sunset. As a coyote howled just a few yards away from our tent in the desert by Lake Roosevelt I took this photo at 18mm, with an ISO of 800, an aperture of f /10, and a shutter speed of 30 seconds. In post-processing I just tweaked a few minor settings such as clarity, highlights, and vibrance. In the end everything worked out just right to allow me to take this photo and always have a reminder of the beauty I had to learn to see. To read more about the Northern Arizona University “Behind the Image: Guest Blogger” project on our blog, please read the introduction at youcansleepwhenyouredead.com/wordpress/4th-annual-northern-arizona-university-behind-the-image-guest-blogger-project. Please take a minute to leave your thoughts and constructive comments in the Comment section below – Emily would love to hear from you! 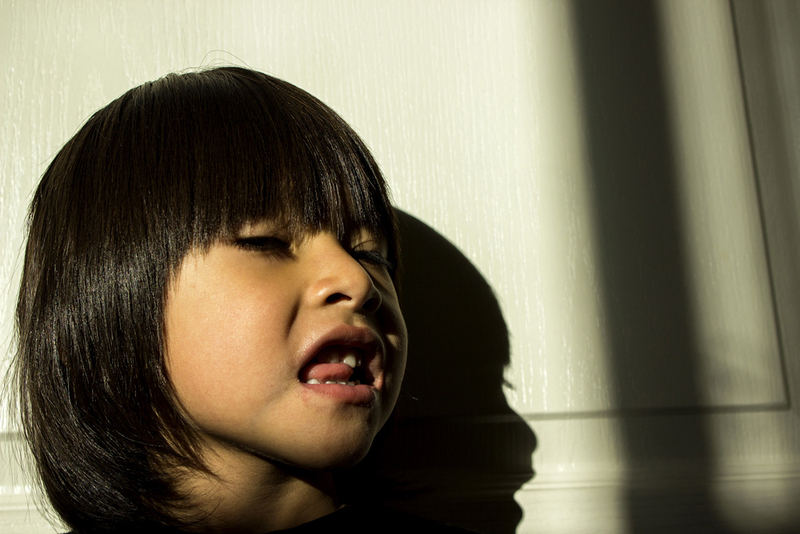 I set out on this photo by trying to find a subject to shoot for window light for an in class assignment. I had scrambled around trying to figure out what I could shoot that would look good. I finally asked my boy, who is 4 years old, if he could let me take a picture of him. He was very excited to do this. This was also my first time that I had asked him to pose for me for a shoot. I captured images of him smiling when I told him to, and facing in different directions. This image shows the true emotions of how he was feeling, tired and grumpy. He just wanted to have it over with and go do something else. Thus, the reasons in which I chose this photo. So the image, a portrait, uses the window light as my only source of lighting. I have taken a few portraits but still feel hesitant taking them, as portraits are a challenge for me. The image shows the raw emotion of my boy. I took quite a few photos of him. I had him look this and that way, to smile. Like any child would, he began to get tired and no longer wanted to participate. He was ready to go play but I called him back and told him just one more then you can go play. He reluctantly agreed too. He was not taking any direction; he was done with all that. I asked him to smile and in return he made this face. What I get from the expression of his face is that he is telling me to be quiet, to stop telling him what to do and to just hurry up and take the photo. The camera which I used is the Canon Rebel T3i with the 18-55mm kit lens. I shot this with an aperture of 5.6, ISO at 200, at 1/500 of a sec., and focal length at 36mm from an angle lower than the subject. For post processing I lowered the highlights, added some contrast, and added just a bit of clarity. Nothing crazy. I like to keep my edits as minimal as possible. I would have cropped the far right shadow out but felt it added to the image, it added some depth. I am drawn to the idea of photography but have never jumped on it. Finally, I decided to take a couple of classes at Coconino Community College. I enjoyed it and I am now minoring in photography at Northern Arizona University. I am drawn to the outdoors, to nature, so this is what a lot of my work consists of. I enjoy that sense of freedom and calmness from the outdoors, away from that concrete jungle. I appreciate the little things in life that the natural world around us has to offer, things that some may tend to overlook. To read more about the Northern Arizona University “Behind the Image: Guest Blogger” project on our blog, please read the introduction at youcansleepwhenyouredead.com/wordpress/4th-annual-northern-arizona-university-behind-the-image-guest-blogger-project. Please take a minute to leave your thoughts and constructive comments in the Comment section below – Wendel would love to hear from you!